Hundreds of years before Alanna first drew her sword in Tamora Pierce’s memorable debut, Alanna: The First Adventure, Tortall had a heroine named Beka Cooper–a fierce young woman who fights crime in a world of magic. 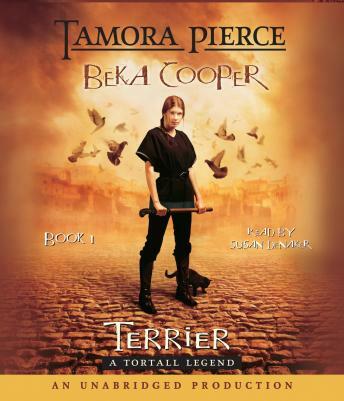 This is the beginning of her story, her legend, and her legacy. . . .
Beka Cooper is a rookie with the law-enforcing Provost’s Guard, commonly known as “the Provost’s Dogs.” To the surprise of both the veteran “Dogs” and her fellow “puppies,” Beka requests duty in the Lower City. The Lower City is a tough beat. But it’s also where Beka was born, and she’s comfortable there. Beka gets her wish. She’s assigned to work with Mattes and Clary, famed veterans among the Provost’s Dogs, and they don’t know that Beka has something unique to offer. Beka is a good listener. So good, in fact, that she hears things that Mattes and Clary never could–information that is passed in murmurs when flocks of pigeons gather . . . murmurs that are the words of the dead. And the ranks of the dead will be growing if the Dogs can’t stop a crime wave the likes of which has never been seen. Luckily for the people of the Lower City, the new puppy is a true terrier!